It’s just beginning to feel real Wintry here in NYC. It happens that way each year, where one day, it just gets cold and we begin to hunker down for the Winter ahead. We roast squash and make soup and need to wear socks to bed. It’s a new season and we learn how to submit to it. In terms of cooking, the warmer and heartier the better. I’ve been making soups like crazy and roasting a whole kabocha squash each week. Some people feel daunted by the produce limitations, but I’ve learned some things over the years to help inspire cold-weather cooking. Besides beans, lentils, etc, I always have preserved tomatoes on hand: canned, chopped, fire-roasted or whatever you like. It’s the simplest thing to keep around that can make cold, Winter nights a little better. I use them in soups, make a quick tomato sauce, a savory braise - the options are endless. We may not have fresh tomatoes, but we wouldn’t want to eat them this time of year anyway. It’s time for baking, braising, roasting - all the warm things in life. -This recipe, at its base, is a simple crumble. I used romesco and cannellinni beans, but you could use any veggies or herbs you have on hand and need to get rid of! A few notes, too: you can use all cornmeal instead of cornmeal/corn flour to keep it simple. In a large mixing bowl, whisk chopped tomatoes together with cornstarch, lemon juice + zest, tamarin, sumac, salt and red pepper flakes. Then, stir in romesco, beans, garlic, shallot and herbs until well combined. Add to 9x9 or similar sized baking dish and set aside. In another mixing bowl, stir together oats, almond meal, cornmeal and flour, parmesan, thyme and salt. Mix until well combined, then add chilled butter cubes, Using your hands, work together dough - breaking down butter - until mixture looks and feels like oatmeal cookie dough. Add olive oil, and mix in well with your hands, making sure to get all the flour bits at the bottom. Add crumble evenly over top tomato filling. Bake for exactly 30 minutes or until tomato is bubbling up around the sides and topping is golden browned. Let cool for 15 minutes before serving. THIS POST HAS BEEN SPONSORED BY POMI. THANK YOU FOR SUPPORTING THE BRANDS THAT SUPPORT SASSY KITCHEN! It’s finally become Winter in New York. It took an extra long time this year, and I’ve been relishing in the pleasantly chill 60 degrees until now. Although it feels like the tropics in my apartment (could be worse), I’m still craving warming meals. This soup is perfect for those chilly nights when you need something to pack a punch and simultaneously shun any & all Winter colds. Luckily it also serves a crowd, so you’ll have leftovers all week or the perfect opportunity to throw a soup party (they’re real). I’ve always loved the act of making soup, when you have the time to casually prep ingredients and let it simmer on the stove for hours. It’s one of those things, like pie-making, that require a little more effort, but if you enjoy the process rather than oppose it, the act becomes a totally different thing. Pies are obviously prettier (and a little more fun), but with soup I actually enjoy the process of cutting, peeling & dicing a ton of vegetables. It’s meditative and calming on the days when I need a little more balance in my life. Since food has always been the thing I return to when I need solace, comfort, warmth. I promise, if nothing else, this soup will taste good, but it also might just lift your spirits. In a large, heavy-bottomed pot, add olive oil, onion, garlic and ginger over medium heat. Stir until fragrant, about 3-5 minutes. Then, add chopped carrot and pumpkin. Stir for 5-7 minutes, then add marjoram, bay leaves, broth and red lentils. Bring soup to a boil, then simmer. Stir in all spices and tamari, then let the soup stew for 30-35 minutes or until pumpkin and carrots are tender. 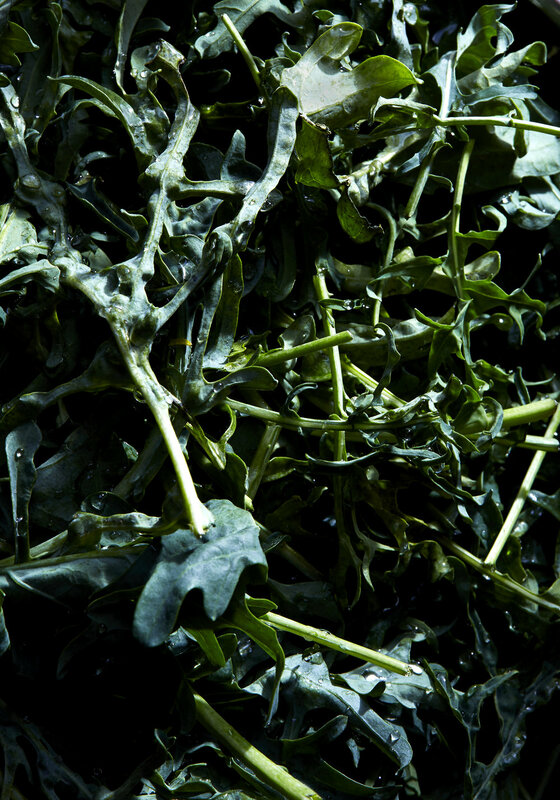 Add torn pieces of kale leaves right before serving, letting them cook gently in the hot soup. Season to taste with sea salt and ground pepper. (don’t be shy with the salt!) To serve, sprinkle sea salt atop, and a dollop of sour cream or yogurt. Serve piping hot. Cauliflower is Broccoli's forgotten cousin. Only lately have people begin to bat an eye at this cruciferous vegetable. Besides being delicious, cauliflower has some magical properties that allow it to become grain-free pizza crust and "rice" to name a few. This recipe, however, uses no gimmicks - just pure cauliflower goodness. Preheat oven to 375 degrees. Add cauliflower to a large baking sheet with olive oil, marjoram, sea salt and freshly ground pepper to taste. Roast for 25-30 minutes or until browned and tender. Add to serving bowl & set aside. Add butter to a cast iron or sauté pan over medium low heat. Add the zest of one lemon. Sauté until zest is fragrant, then add garlic and leeks. Stir often over low heat until leeks are softened, about 5-7 minutes. Add golden raisins until warm, then remove mixture and add to serving bowl. Using the same pan, turn the heat up to medium and add pine nuts. Stir often for about 1-2 minutes or until pine nuts are browned and toasted. Remove from heat and add to serving bowl. 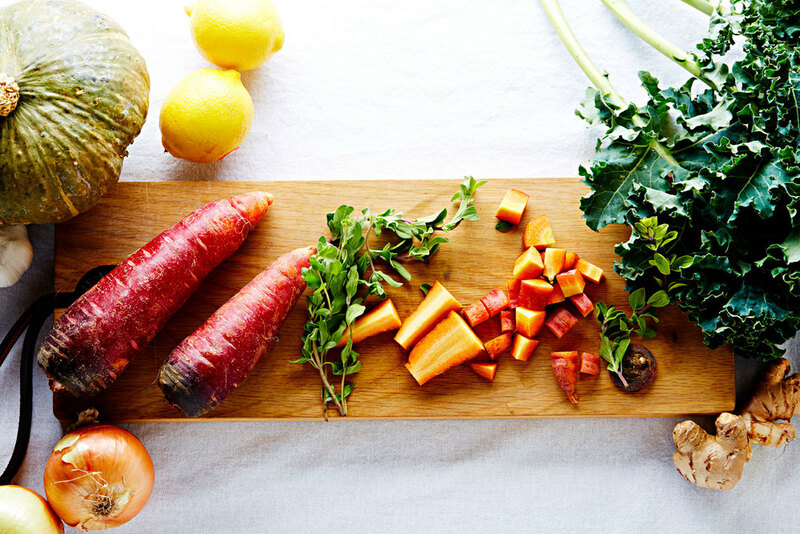 Toss everything together with the juice of one lemon. Top with chopped parsley and season to taste. Serve immediately!